Welcome to a brand new Cornerfolds feature! 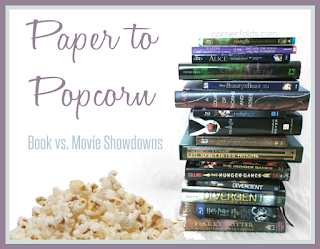 Paper to Popcorn will not be your typical book vs. movie comparison, or at least that is not all it will be. 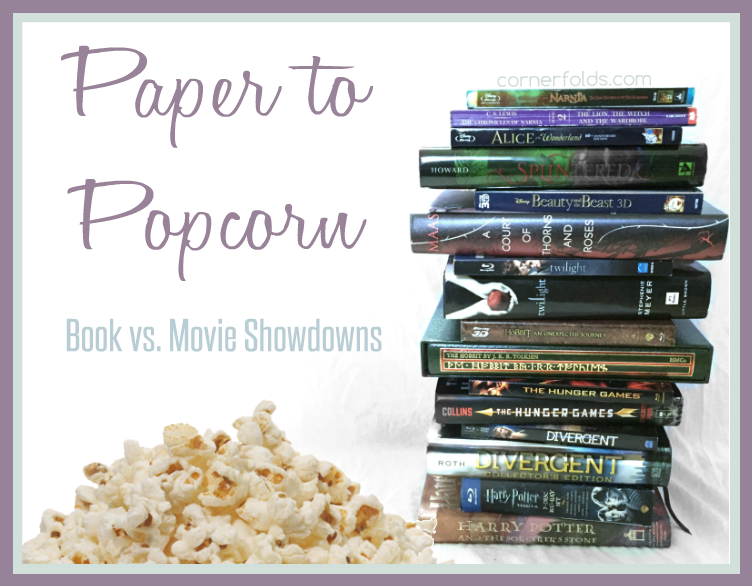 Each featured book/movie combo will battle it out in a showdown to prove which one is the best (at least in my obviously humble opinion). Each will feature what are essentially mini-reviews of both the film and book in question, a brief outline of differences between the book and film adaptation, will rate the two on the basic (but important) aspects of setting, plot, and characters, and ultimately a victor will be chosen. 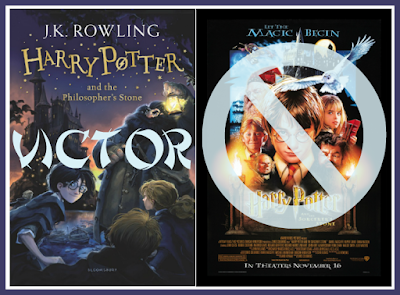 These new editions of the classic and internationally bestselling, multi-award-winning series feature instantly pick-up-able new jackets with huge child appeal, to bring Harry Potter to the next generation of readers. It's time to PASS THE MAGIC ON . There is something magical about Harry Potter that I really can't understand. I never got to read it as a child for... reasons. But I did FINALLY get to watch the movies starting in late 2006. Then, in 2011, something amazing happened... I read the series for the first time and fell in love. I've never quite understood re-reads though and I never thought I'd give Harry another glance other than having as many gorgeous editions as possible lining my shelves. But then something worked itself loose in my noggin and I changed my mind. Thus began the great Harry Potter re-read of 2015. Harry Potter and the Philosopher's Stone is magic. I know that's pretty cheesy to say about a book that's literally about magic, but I don't know any other way to describe it. As I was reading this book I thought to myself (on several occasions), "How did J.K. Rowling think this stuff up?!" And reading it for the second time is even better because you can see how intertwined everything really is all the way through book seven. 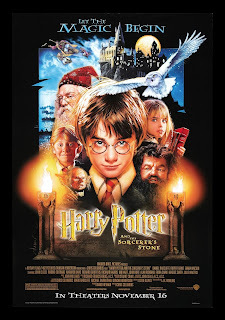 I cannot think of one thing to complain about in Harry Potter and the Philosopher's Stone and you can rest assured it isn't nostalgia talking. This is just good storytelling, plain and simple. 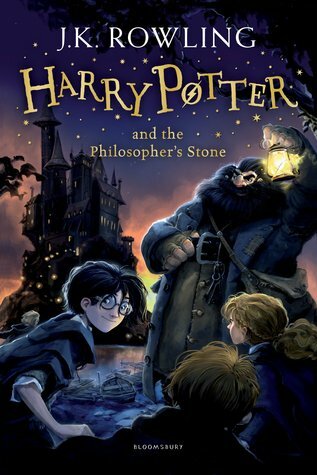 The characters are sympathetic (even Hermione later on, although she starts as a nightmare), the world building is spectacular, and I was totally sucked back into the world of Harry Potter from page one. And can we take a second to appreciate these awesome new UK covers? The artwork is absolutely gorgeous! Knowing now how amazing these books are makes me really sad that I never got to experience them from a child's perspective. Despite that, I am so glad I DID get to read them as an adult and I have finally discovered what everyone loves so much about re-reads! I can't wait to pick up book two! Harry Potter and the Sorcerer's Stone is nearly as magical as it's book counterpart. Nearly. It has all the elements that make the book so magical and it's obvious that J.K. Rowling had a hand in the development of the film adaptation. While there were changes from the book, there were none that really changed the story or struck me as really major. Overall, this is a fantastic book to movie success! Unfortunately, while it is a great movie, it is one that really has not aged well at all. There are two main things that took this movie down a notch. The first is the cast. Let me get this out of the way first: the actors who were chosen to play each of these characters are absolutely perfect! Because I know it gets better, I can confidently say the casting was perfect while the acting sucked. Daniel Radcliffe (Harry) and Emma Watson (Hermione) are completely terrible! I can't even say which was worst because they were both so bad. Rupert Grint (Ron) and Tom Felton (Draco) were the best of the first years, in my opinion! On the other hand, every single one of the older actors was fantastic! Maggie Smith (Professor McGonagall) and Alan Rickman (Snape) were the highlights of the movie! The other major issue with this film is the CGI. It's abysmal. I know this movie was made nearly 14 years ago, but I can't imagine that people back then didn't notice how fake certain scenes looked, especially on the big screen. Examples that come to mind are the troll, the quidditch match, Fluffy, the centaur, Voldemort's face... Basically everything that was a creature or in the air. The Sorcerer's Stone soundtrack, however, is just amazing! I'd say it's almost as good as the soundtrack for The Lord of the Rings trilogy... almost. The music works perfectly in each scene and the songs get stuck in my head for days every time I watch this! Overall (as I've said already) this is a great book to film adaptation! I'm sure I would have loved it if I had seen it when I was 13, when this movie came out. Despite its flaws, this movie is the must see first film in a must see series! Harry goes straight to school after meeting Hagrid in the movie, but in the book he goes back home with the Dursleys for awhile first. In the book Dumbledore is portrayed as a really eccentric (honestly really strange) man, but in the movie he's shown as a much more serious professor. Conversely, the Bloody Baron is terrifying in the book and everyone is afraid of him, but the brief glimpse of him in the movie makes him seem really goofy. Peeves, the castle poltergeist, is absent. In the movie it's only Harry's parents in the Mirror of Erised rather than his whole family. In the book Harry, Ron, and Hermione take Hagrid's dragon up a tower to be rescued by friends of Charlie Weasley, but this is left out of the movie. Ron goes to detention with Harry, Hermione, and Draco instead of Neville. In the movie there's only one centaur (Firenze) instead of including Bane and Ronan. This happens to be the one centaur from the book who is friendly rather than cynical. In the movie Harry, Ron, and Hermione fall through the Devil's Snare instead of climbing out of it and Hermione defeats the plant with sunlight instead of fire. Quirrell's skin blisters in the book when Harry touches him, but in the movie he turns to stone. Though not by much, the winner of this competition is clearly the book! The movie is excellent, but seems to take on a much lighter tone than the already light tone of the book. I love that the books (and the movies) get darker as they go on, but I'm not sure why the filmmakers felt that they had to change the personalities of Dumbledore, the ghosts, and leave out the less savory characters of Peeves and the rest of the centaurs in the Forbidden/Dark Forest. Perhaps by leaving out these darker elements a larger audience was reached by the film. 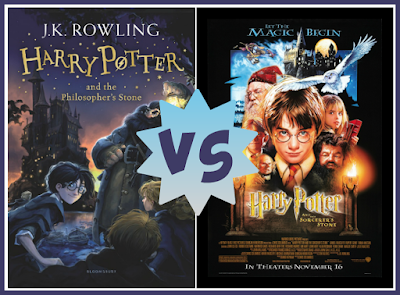 While the movie is a great representation of the book, both are excellent on their own as well.